In October, I got married. 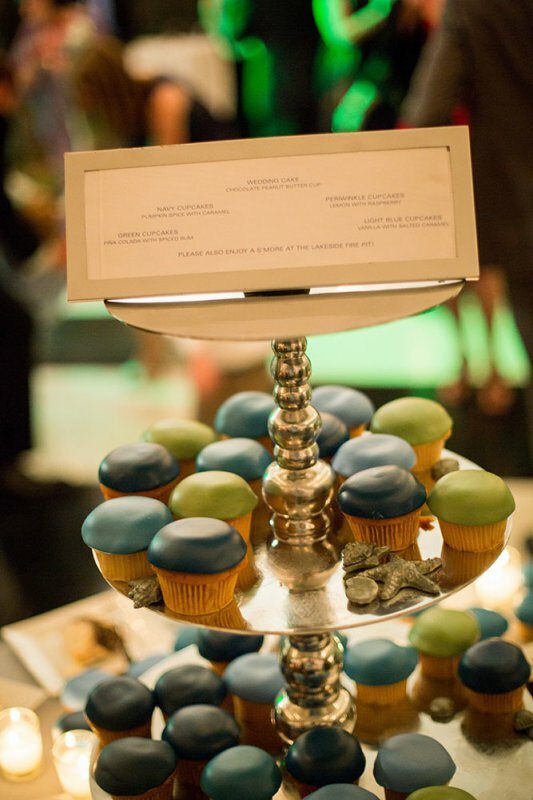 And there were cupcakes. 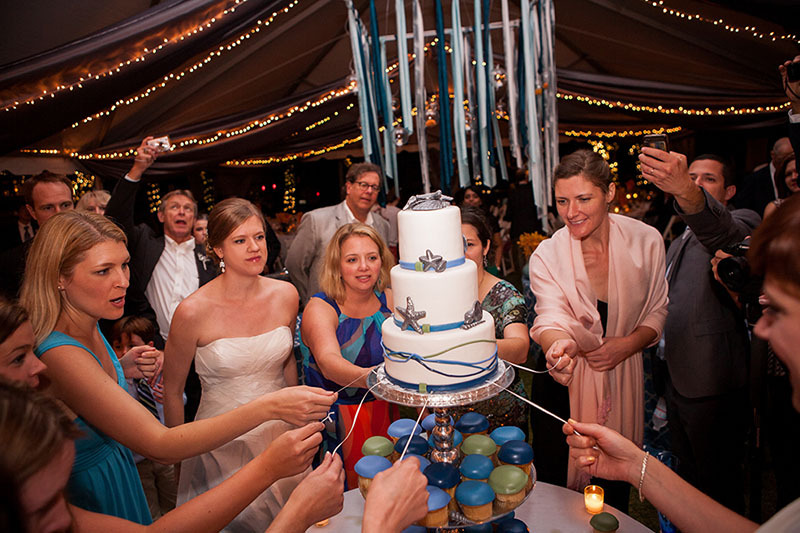 The wedding cake was, of course, one of the most important things to plan. 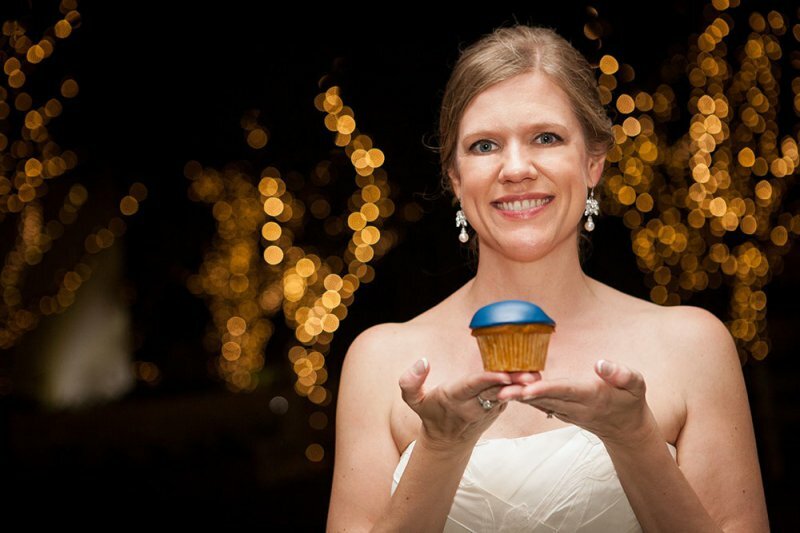 To read about our tasting and planning with Kara of KaraBoo Bakery, see my post “Travel Treats: Miramar Beach, Florida.” We discussed the design and Kara sketched it out for me, but I didn’t see the result of our master plan until we entered our reception and finished our first dance. I was delighted with the final product. Thank you KaraBoo! 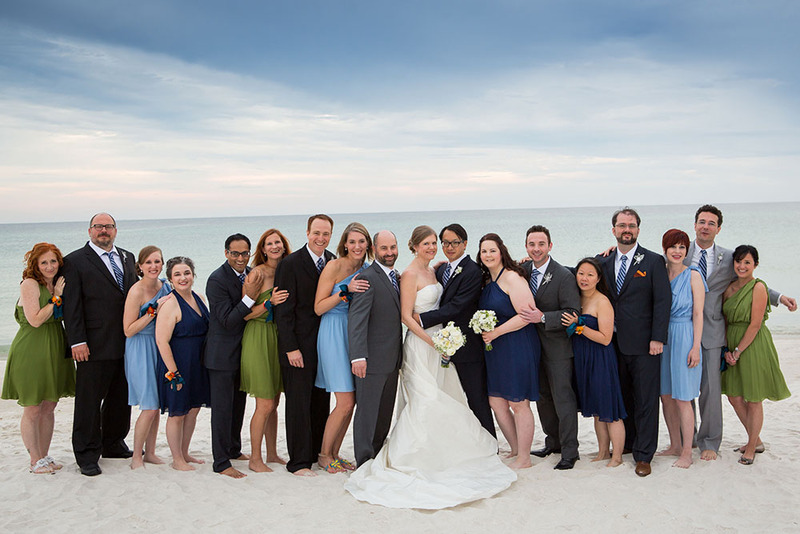 Ours was a beach wedding. It took place at Carillon Beach, which is a beachside community on the Gulf of Mexico near Panama City Beach, Florida. 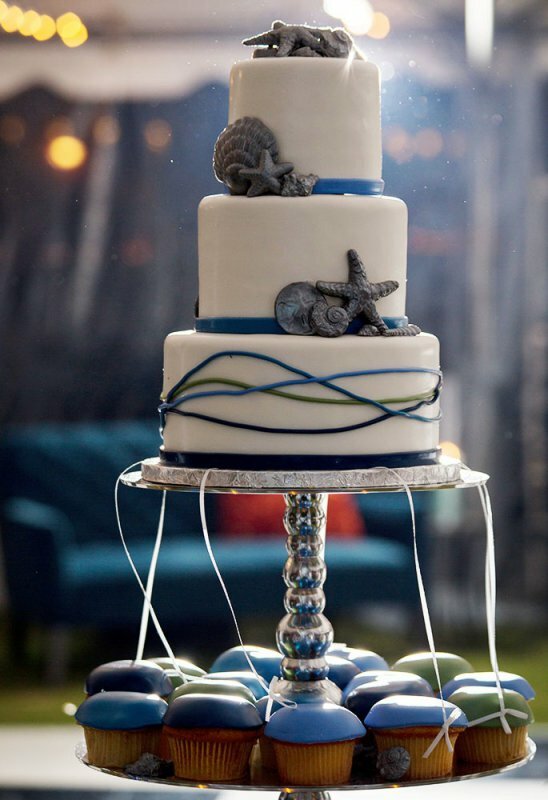 We used blues and greens and silver seashells in the wedding décor to reflect the beach theme and definitely wanted that carried over to our cake. We also wanted to use a version of the wave “logo” that showed up in various wedding materials and we thought could work on a cake, too. 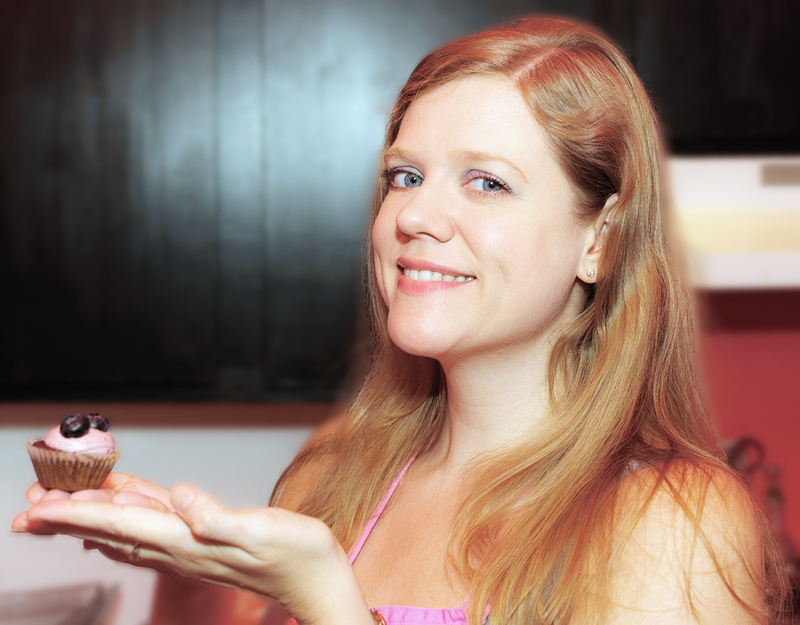 A traditional tiered cake to cut was a must, but I had to have cupcakes, too. The bonus was that this meant we could have five different delicious cake/frosting combinations. The main cake was three layers of Peanut Butter Cup (black velvet cake with peanut butter cup filling and peanut buttercream), then we had four flavors of cupcakes, color coded. So tasty… I only got to take a few bites at the actual reception, but leftover cupcakes were breakfast for the next three days. Now that’s the way to start a marriage! 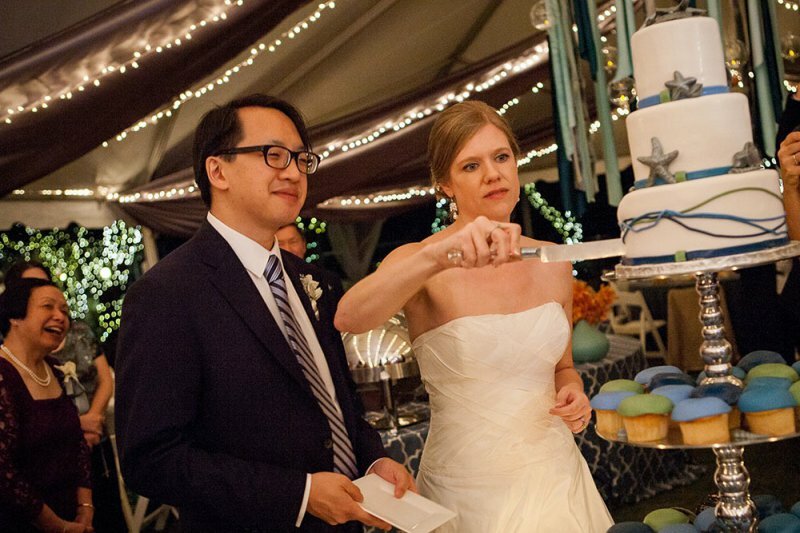 Cutting the cake was serious business, and my newly minted husband let me do the honors. I was really concentrating at this point. After all, 100 people (including my caterer mother-in-law) were watching. We had a fabulous party with family and friends, and the cake and cupcakes were a highlight of a celebration full of highlights. This crazy crew includes some of the family and friends who made our day possible. They spoke during our ceremony and guided our guests. 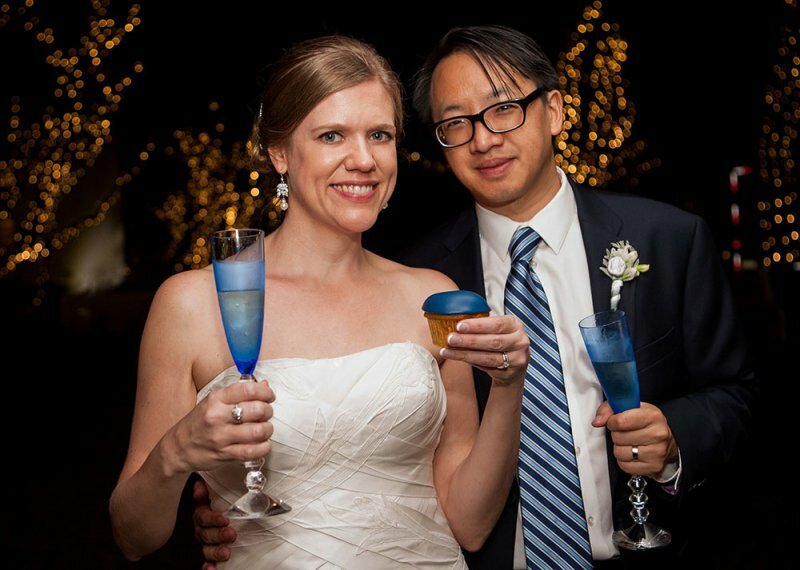 They helped with planning, threw parties, calmed the couple, and toasted our happiness. They let us dress them up. LOVE to our wedding party!